By the same sire as G1 winners SANTA ANA LANE & VEGA MAGIC!! Domain Thoroughbreds are proud to offer this outstanding Magic Millions filly by champion European stallion LOPE DE VEGA out of a superbly bred Hussonet mare SONETTE. WE GOT THE FILLY WE WANTED!! - Her grandmother is the great Park Express! A blue hen mare in Europe who was Joint Champion 2YO & Champion 3YO Filly in Ireland. This filly has an exceptional pedigree full of BLACK TYPE! THERE IS 10 x 2YO WINNERS ON THE PAGE & PLENTY OF CHAMPIONS TO GO WITH IT! 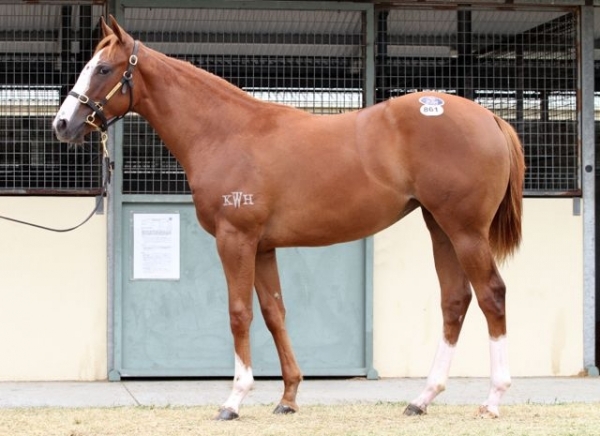 This filly will have exceptional residual value after she finishing racing. This filly is a beautiful mover and looks like she will be up and running in no time! 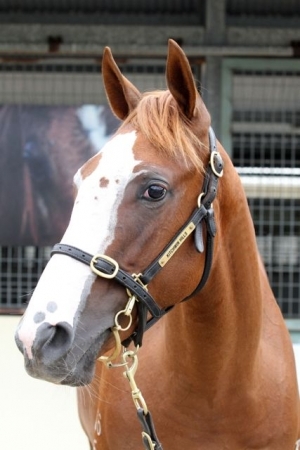 2YO MAGIC MILLIONS ? BLUE DIAMOND ? GOLDEN SLIPPER ? LOPE DE VEGA (IRE) (Chestnut 2007-Stud 2011). 4 wins-2 at 2, Chantilly Prix du Jockey Club, Gr.1. Sire of 292 rnrs, 165 wnrs, 24 SW, inc. Belardo (Newmarket Dewhurst S., Gr.1), Jemayel, Hero Look, Very Special, French Fern, The Right Man, Vega Magic, Navarra King, South Seas, Blue de Vega, Burnt Sugar, Ride Like the Wind, Royal Razalma, Santa Ana Lane, Fort del Oro, Candy Store, Steel of Madrid, Consort, Eskimo Point, Man of His Word, etc. Ross River - Je Pense (H.K.) (g. by Dane Shadow). Winner at 1700m in 2015-16, Ipswich TC Queensland Times H., 3d BRC Giddy Up P.
CASTLETHORPE (Not a Single Doubt). 9 wins from 1200m to 1600m, R972,815, Kenilworth Winter Guineas, Gr.3, Fairview East Cape Sprint Cup, L, Clairwood GPS Plastics S., Kenilworth Official J&B Met After Party H., Greyville Morris Vee H., Kenilworth Racing. It's a Rush S., 2d Clairwood Gold Challenge, Gr.1, Kenilworth Diadem S., Gr.2, Clairwood Betting World Numbers P., Kenilworth BMW Pinnacle S., First National Bank S., Racing, Its a Rush H., 3d Durbanville Matchem S., Gr.3, Kenilworth Magnum Mile, Rubgy 5 Tackle it P., 4th Clairwood Gold Challenge, Gr.1, Kenilworth Selangor Cup, Gr.2, Merchants S., Gr.2, Clairwood In Full Flight H., L.
Anna Sophia (Oasis Dream). 2 wins-1 at 2-at 5f, 7f, 3d Belmont Smart & Fancy S., L, 4th Pimlico Hilltop S., L.
Bayraqdaar. 2 wins-1 at 2-at 1000m, 1550m, STC Campbells Cash & Carry H., 2d STC Aurora 2YO P., 3d STC South Sydney Supporters 2YO H.
QUIET OASIS (Oasis Dream). 4 wins-1 at 2-from 6½f to 1m, £7,216, €1,799, US$268,800, Hollywood Park Royal Heroine Mile, Gr.2, Wilshire H., Gr.3, Kempton Amdocs Management 2YO S., Santa Anita Allowance, 2d Hollywood Park Gamely S., Gr.1, Santa Anita La Habra S., Gr.3, 3d Santa Anita Santa Ana S., Gr.2, Newmarket Home of Racing 2YO Fillies S., 4th Curragh Park S., Gr.3. YOUNG PRETENDER (Oasis Dream). 2 wins at 2, Longchamp Prix La Rochette, Gr.3, Newmarket July Course Series 2YO S., 2d Doncaster Robinhoodairport.com S., 3d Epsom Diomed S., Gr.3. NEW APPROACH (Galileo). Champion 2YO & 3YO Colt in Europe in 2007 & 2008. Champion 3YO in GB in 2008 (Intermediate). Champion 3YO in Ireland in 2008 (Intermediate & Long). 8 wins-5 at 2-from 7f to 1½m, £1,302,317, €858,708, The Derby, Gr.1, Curragh National S., Gr.1, Leopardstown Irish Champion S., Gr.1, Newmarket Champion S., Gr.1, Dewhurst S., Gr.1, Curragh Futurity S., Gr.2, Leopardstown Tyros S., Gr.3, Curragh Jebel Ali Stables 2YO S., 2d The Two Thousand Guineas, Gr.1, Irish Two Thousand Guineas, Gr.1, 3d Newmarket International S., Gr.1. Sire. ALFRED NOBEL (Danehill Dancer). 3 wins at 2, £24,600, €227,166, Curragh Phoenix S., Gr.1, Railway S., Gr.2, Leopardstown Irish Stallion Farms 2YO S., 3d Curragh Greenlands S., Gr.3, Strategic Prince 2YO S. Sire. SHINKO FOREST (Green Desert). 9 wins at 1200m, 349,079,000¥, Chukyo Takamatsunomiya Kinen, Jpn-1, Hakodate Sprint S., Jpn-3, Hanshin Hankyu Hai, Jpn-3, Nakayama Ocean S., 3d Chukyo Takamatsunomiya Hai, Jpn-1-twice, Kyoto Silk Road S., Jpn-3. Sire. Tycoon King (Last Tycoon). 9 wins-1 at 2-from 1200m to 3600m, Longchamp Prix du Marais, Deauville Prix de Granville, 2d Evry Prix Montenica, L, Deauville Prix du Val Richer, Longchamp Prix du Casino Barriere d'Hossegor, 3d Longchamp Prix de Saint-Nicolas. WAS (Galileo). 2 wins-1 at 2-at 1m, 1½m, £261,104, €70,505, The Oaks, Gr.1, Curragh Irish Stallion Farms 2YO Fillies S., 2d Curragh Pretty Polly S., Gr.1, 3d Yorkshire Oaks, Gr.1, Goodwood Nassau S., Gr.1, Naas Blue Wind S., Gr.3, 4th Irish Oaks, Gr.1, Curragh Ridgewood Pearl S., Gr.3. JANOOD (Medicean). 2 wins at 2, Newbury Washington Singer S., L, Newmarket 2YO S.
Douglas Macarthur (Galileo). Winner at 2 in 2016, Leopardstown Frank Conroy 2YO S., 3d Leopardstown Golden Fleece S., Gr.3, 4th Criterium de Saint-Cloud, Gr.1. Al Naamah (Galileo). Winner at 2, Chantilly Prix de Pontpoint, 2d Saint-Cloud Prix Cleopatre, Gr.3, Longchamp Prix de Thiberville, L, 3d Deauville Prix Minerve, Gr.3. SOPRAN VERNE (Approve). 2 wins at 2 in 2016, Rome Premio Ubaldo Pandolfi, L, Milan Premio Laveno, 2d Milan Premio Eupili, L.
King of Normandy (Soldier of Fortune). Winner at 8¼f, 3d Newbury Horris Hill S., Gr.3.